Stop thinking, and start drinking! 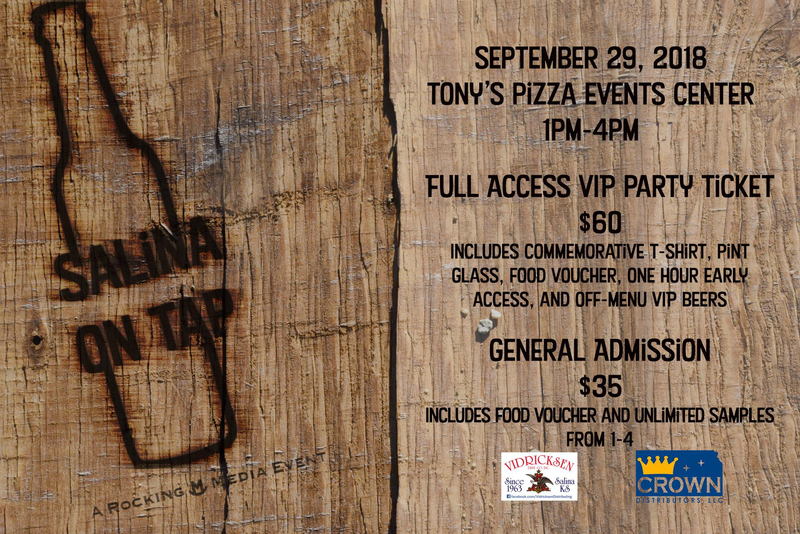 Salina on Tap is back on September 29th in Heritage Hall at Tony’s Pizza Events Center! Enjoy craft beers from brewers as far away as Portland, and from right here in the heart of Salina! Meet the brewers, enjoy some of your favorite flavors and discover new tastes all while jamming to the sounds of local musicians on the main stage. Unlimited samples await you for as low as $35. With a general admission ticket, try unlimited samples from 1-4 and take advantage of the food voucher. Or, up the ante and go for the VIP experience; enjoy an extra hour of tasting, a commemorative pint glass and t-shirt and a food voucher. A limited number of premium tickets are available to continue the party from the Tony’s Pizza Events Center to Downtown Salina where the party can continue at Blue Skye Brewery! Some of your favorite breweries have already said they’ll be there: Wichita Brewing Company, Liquid Bread, Defiance, Hopping Gnome, Shocktop, Sierra Nevada, New Belgium, Boulevard, Kansas Territory, Four Hands, Dogfish Head, Founders and Deschutes… stay tuned for more breweries in the coming months!